How do we “move public opinion”? Michigan NORML engages in many types of cannabis advocacy to influence not only what the public thinks, but more importantly, we target our advocacy to influence what voters and legislators think! Michigan NORML board members believe that our scarce resources should be utilized in the most efficient and responsible manner. Our comprehensive approach to advocacy, or moving public opinion, combines the modern tools of today’s technology-driven world with the personal contact and relationship-building techniques that have been standard operating procedure for cannabis advocates since at least 1970! We make extensive use of our powerful social media platform including Facebook and Twitter to broadcast our message and important information to thousands of people every day! We also stay in close contact with our supporters and allies by employing the latest organizational management software tools! We are a subscriber of the Action Network and we’ve integrated their supporter management platform into our modern WordPress website. Michigan NORML board members are frequently being asked for responses to breaking stories and policy changes that effect cannabis consumers. Sometimes, multiple board members make multiple appearances in one form of media or another, all on the same day! Speaking to the media is nothing new or frightening for the salty activists here. Our board includes an attorney, a physician and other highly skilled and motivated advocates with over a century of activism collectively! 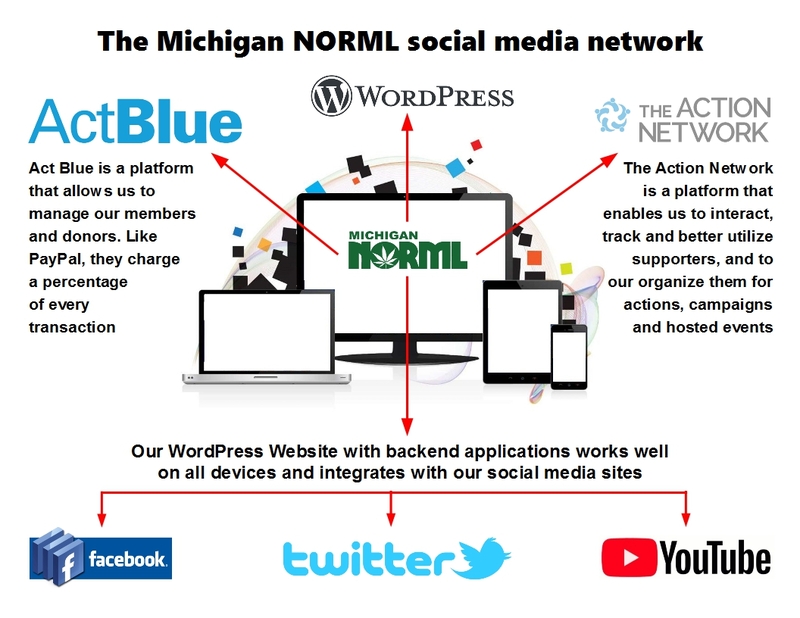 In January of 2018, Michigan NORML board members appeared in over a dozen media stories! That’s how we move public opinion! Our board members also attend and testify at legislative committee hearings, and State agency board meetings and committee hearings. We voice the concerns of cannabis consumers to the people in power. We can’t force them to adopt sensible policies, but we can communicate to them the concerns of the 1.5+ million cannabis consumers in this great state! Watch this video of Communications Director Rick Thompson eloquently articulating our collective concerns about policies being considered by the Bureau of Medical Marihuana Regulation Licensing Board meeting in August of 2017. This is what we do for our members, our supporters, and the cannabis consumers of Michigan! We also make appearances at conferences, festivals and a variety of other social events throughout the year and extend our fellowship beyond the halls of power. Many times one or more of our board members speaks at these events or is asked to be part of a moderated panel discussion. There are also times when we set up a 10×10 booth, and again, sometimes we do both. We also host events ourselves a few times a year because interacting with our supporters is important to us! We are all common friends when it comes to ending the war on cannabis and we would like the pleasure of meeting the face of the back we help protect and who also supports us! Michigan NORML also hosts activities designed to get our supporters involved and to create those personal connections! Our signature event is our Annual Mackinac Bridge Walk to End Hemp & Cannabis Prohibition. Each Labor Day our group assembles under the Flagpole at the Bridge Authority Building in St. Ignace. There, we hand out a free commemorative Tshirt to our supporters, and walk the 5-mile span of the mighty Mackinac Bridge. This event gives us an opportunity to interact with 50,000 people who may or may not understand our issue and we spend the next 4 hours discussing cannabis with everybody! At the end of the Walk, we also set up shop at a nearby public pavilion and hand out free donuts and beverages to folks who need a quick snack. We hang up a big banner, engage passers-by and people waiting to use the facilities and pass out 10 dozen pastries and 100 beverages every year! That’s freefrom advocacy! We host Lobby Days throughout the year by scheduling periodic days where our supporters can come and meet us in the lobby of the Lansing Capitol Building. Everyone is invited to join MINORML board members as they go on a day-long cavalcade of legislator visits to talk about ending the weed part of the drug war. We schedule several appointments in advance, we encourage our attending supporters to schedule appointments with their legislators, and we cold call other legislators who may be new or need additional information on our issue. It’s a fun and effective way for people to meet their legislators and tell them how they feel about cannabis with a MINORML board member there to back them up with facts. We already told you we had your back! We also host letter writing and phone call campaigns to involve our supporters. We create our own letter campaigns with tools provided by our Action Network partners, and national NORML’s Action Center is stocked with a bunch of great letters just waiting for you to sign and send to your legislators too. Using either option takes less than 5 minutes and it’s a very effective way to engage your legislators. Links to all these simple email actions appear on every email we send to our supporters resulting in thousands of emails sent to legislators! We also energize our social media audience by issuing Action Alerts and by creating actionable graphics. Action Alerts are messages to inform folks about breaking news items and new letter writing campaigns, actionable graphics are pictures with messages containing a call to action. An actionable graphic is similar to a meme, and we have found them to be very effective motivation tools. Additionally, we implement dozens of impromptu social media and email campaigns each year based on a news and events that impact cannabis consumers. All our campaigns are designed to educate our visitors about cannabis issues or encourage the to take an action! We’re still work’n for ya, baby! Everybody says, “What can I do to help legalize weed”, but that’s all they do, even when they are shown what they can do. Above we have explained what we do, what you can do and what we can do together. Take 5 minutes right now and get involved, stop asking what you can do and really do something. Email a letter, find out who your legislator is, call your legislators, attend an event, join Michigan NORML or make a donation to support all the things we do to protect you. If you’ve read this far, you have finally reached the now or never point of the story! It’s all on you now! Act today!